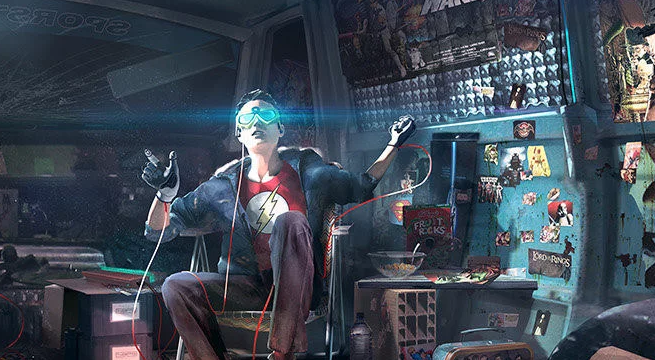 The trailer is already packed with 'easter eggs' -- Tracer from Overwatch, Harley Quinn from the Arkham game series, and the DeLorean from Back to the Future are stand-out moments. Yesterday's release of the all-new theatrical poster was met with some interesting commentary, but it did spare a nod to classic nerd franchises like E.T., which Cline himself confirmed in a tweet earlier on in the day. The novel contains plenty of nerdy nods for readers to find throughout the story (and, obviously, the film), not unlike the story's protagonists as they rush to save the day. A special live stream followed the release, giving fans even more information on what to expect from the film. The story line follows protagonist Wade Watts, a passionate gamer, who is forced to race against the clock in order to find easter eggs left by the creator of his favorite MMO-slash-virtual-community, OASIS. But the game is far more than it looks, and other forces are out for control of OASIS. It's up to Watts and his friends to save the game and keep control of it out of the hands of those who would use it for evil. Based off of the popular 2011 novel (with an audiobook read by Star Trek alum Wil Wheaton), Ready Player One stars Tye Sheridan (X-Men: Apocalypse) and Olivia Cooke (Bates Motel), directed by the legendary Steven Spielberg with a screenplay by Cline and Zak Penn.